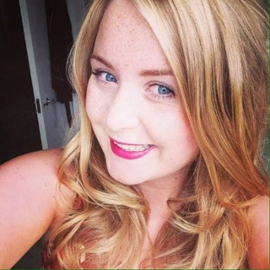 My name is Holly Maxwell- Stevenson, I am 21- years old and I have a lifelong disability. I have always had excruciating neck pain. I was always told “everyone gets a bad neck from time to time” and just to wait it out. The disregard from all of the doctors which I saw led me to believe for a very long time that I just had a ridiculously low pain threshold but I always knew in the back of my mind that everyone was not experiencing this sort of constant agony, not even from “time to time”. I’m not a retiring person but god forbid if I had been because I still would be none the wiser as to what my disability is, or that I even have one. I hounded doctors, begged for referrals for anyone who would see me and when I was asked to rank my pain I always said 10 and I wasn’t being melodramatic – it always was and is always 10. When I finally made it up to the spine clinic I thought I was finally on the road to answers. However, my reflexes were fine, I could grip the doctor’s fingers and he dismissed me telling me to stand up straighter and to constantly switch the shoulder I carried my handbag on. I was devastated – why was nobody taking me seriously? Even my faultless parents were beginning to think I was a hypochondriac because “surely if there was something significantly wrong with you they would have found it by now!” Well, so you would think, but no…. I cried in this spine consultant’s office, I told him that I would not accept my pain and myself being marginalised and that I urgently needed help. He told me that for “my piece of mind” I could have an MRI scan but that it really was not required and was actually a bit of a drain on resources. I took the MRI. I was 19, I looked healthy and I always had a smile on my face and I hoped that advanced machinery would lead me to answers! Nothing in this world could have prepared me for the results which I got when I went back for my MRI consultation after the scan. I was expecting a slipped disk, trapped nerve – anything really that would explain that my pain was not all in my head but something that could be fixed. I was not ready for the response which I got: “We’ve received your MRI results and we did find an abnormality but your neck is fine, IT’S YOUR BRAIN THAT’S THE PROBLEM”. So, there we have it, I am disabled. I’m not embarrassed about it and whilst I obviously don’t shout it from the rooftops or use it as an icebreaker when meeting new people, I don’t try to hide it either. As things stand at the moment, over two years on from my diagnosis, I am in no less pain. All that medication results in, if anything, is nausea. Massages help me at the time but are a very expensive way to get short-lived relief. I’ve attended chronic pain management classes and aside from becoming slightly depressed that everyone else was at least double my age, had to stop working long before retirement age through ill health and had practically all tried to take their own life, coping with lifelong pain is all that can do for me; nothing and nobody will get rid of my pain. I was offered brain surgery which to me is a major surgery and let’s face it, whilst my pain is torture I feel I can avoid surgery which sounds very scary. As I sit and write this in a coffee shop in the middle of Glasgow I would probably place at the bottom of a list if I asked someone to rank the likelihood of who was disabled in the café. I do not look disabled, I do not sound disabled, I’m a final year student at Glasgow University and I spent last year studying abroad in Oklahoma. I won’t let my disability define me but I won’t pretend I don’t have it either. It is absolutely true that you don’t appreciate your health until you don’t have it anymore; I’ve always found that whenever I have a bad cold. My neck will never stop to be sore and I honestly cannot remember a time when I was not in crippling agony but I soldier on because this is the hand I was dealt. I’m not writing this for sympathy and I’m not writing it for praise. I’m writing it to let everybody know that your health is something to never take for granted because some of us never fully have it and cannot ever get it back. My life mantra is that “life is a blessing, stop stressing” and I always keep in the back of my head that there are people out in the world far worse off than me. The Brain & Spine Foundation are an extraordinary charity. Their slogan “not all disabilities are visible” aptly sums up my article. I will not stop spreading awareness until I do not have to explain what Arnold Chiari Malformation is every time I mention it, even to medical professionals. Maybe it’s ignorance, maybe it’s lack of awareness, maybe people just don’t care because they don’t have it or know anybody with it, maybe we can’t be blamed for that but we shouldn’t think it’s acceptable either. 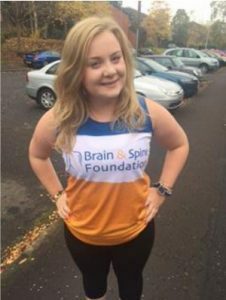 In 2015 I ran and fundraised in aid of the Brain & Spine Foundation and met some of the wonderful staff who devote their lives to the charity. These people are the only individuals I’ve ever met who already knew what my condition was and I’m finally amongst people who “get it” even if they don’t have a disability themselves. I’ll be honest, I didn’t know what my condition was before I was diagnosed but I want that to change. We unfortunately live in a world where we tend to need to be directly affected before we truly care, before we truly listen. I’m in no position to preach but I can tell you this; some days I wake up hating the world, resentful and angry because I don’t know what I did to deserve this disability. Other days I use it to inspire me and to motivate me to achieve. I’m in no position to preach but I can tell you this; life is short so change what you can and accept what you can’t. Never dismiss anyone when they confide in you because one day you might just need them to listen to you. My name is Holly Maxwell-Stevenson, I’m a 21-year-old and I have a lifelong disability. I cannot thank The Brain & Spine Foundation enough for their support or the love from my friends and especially my family. Take nothing for granted, look after yourselves and remember that disabilities are not always visible.